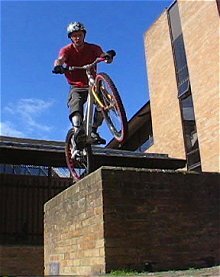 Because it is a flowing move, wheelie off an edge doesn't require you to stop and balance on the rear wheel, yet it gives you much more control than the freeride (flat jump) approach, and more style. If the obstacle surface is smooth enough (without pot-holes), you can start a wheelie quite before the drop off, or even do a manual and then drop off (this is really stylish). 1° Pull a wheelie just when the front wheel is about to leave the edge. Start lifting the front wheel when pushing on the left pedal (if right-footed). 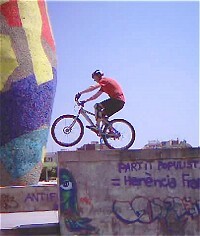 2° Carry on pedalling into a wheelie until the rear wheel reaches the edge. (you should arrive on the edge with your good foot pedal forward). 3° Clear the edge by finishing up the pedal turn, just before the drop off. Let the rear wheel drop down first. 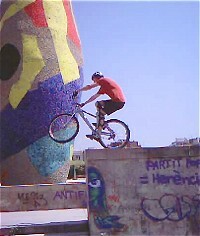 Pull slightly on the bars to avoid a flat landing. You only need room for about one crank turn, or half a pedal turn minimum. Then normal landing, with your good foot pedal forward. Pull the rear brake to a full stop to secure your rear wheel and avoid a crash on your back. That will force your front wheel down too and then you can decide whether you carry on pedaling or not. This technique is neat in urban trials riding, as you can control your direction while doing a wheelie drop off.See this move in a video. This approach is not the best when jumping from very high or if you have to land in a limited space, as it sets you in motion and makes the landing less predictable and more difficult to control than with a short stop balancing on the rear wheel (like in the frontal pedal kick). You just roll away off the edge instead. If the landing area is large enough, wheelie off can be a secure way to jump off an obstacle where maneuvering on the rear wheel can be tricky (with lose grip or very slanted). For mid-heights, it is a nice move that flows smoothly as you can carry on rolling to your next stop. When landing, give the rear brake a slight touch to prevent falling backwards, or even full braking power to force the front wheel down. The more you lean forward, the faster you'll bring the front wheel down. By adjusting your weight further towards the rear hub, and with a lot more practice and experience, you'll be able to land directly into a wheelie or even carry on with a manual after landing. 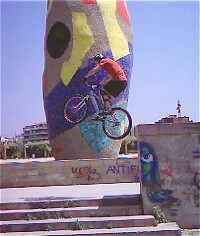 Start jumping off small kerbs and progressively build it up.